The M6800 is impressive, but it's a niche product. If you can justify investing in such a powerful notebook, it excels in every important area, which makes it an excellent high-end workstation. Every aspect of the M6800's design speaks to its business credentials. The chassis is built from aluminium and magnesium alloy, and build quality is top-notch: there's no give on any surface. Dell has also tested this machine using MIL-STD-810G protocols, so it's resistant to dust and works in extreme temperatures. It's versatile, too. There are four USB 3.0 ports, D-SUB, HDMI and DisplayPort outputs, two audio jacks, an Ethernet socket and an SDXC card slot, and it's also got rarer additions: ExpressCard, eSATA and Smart Card slots, a docking station connector, a hot-swappable hard disk and a physical Wi-Fi switch. Dell has kitted this machine out with a traditional keyboard rather than a Scrabble-tile unit. It's a sensible decision, and it boasts an excellent layout, plenty of travel on each key, and a reliable, comfortable action thanks to the high quality feel and rock-solid base. It's a pleasure to use, and the trackpad is good – a tad small, but accurate and with clicky buttons. This is a work laptop, so it also has a trackpoint in the middle of the keyboard with three discrete buttons. Little touches impress. The lid is held in place by an old-school clasp, there are numerous status lights, and the keyboard's backlit. The base panel is held down by just two screws and components are easily accessible – and the screws used on the heatsinks are ordered – plus there's good upgrade room. It's a strong start. 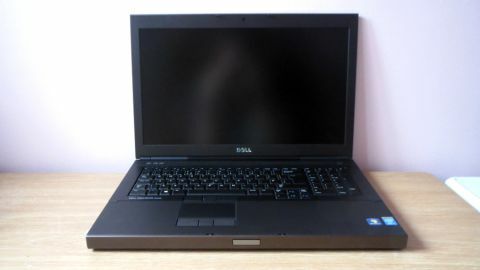 The nearest rival is Dell's own Precision M4800, which is a 15.6-inch version of this machine. Those who yearn for bigger screens could look at the Toshiba Satellite P70, or HP Envy Leap Motion – neither are workstations, but they're larger laptops that are slimmer and lighter than the M6800. There's also Dell's own Precision M3800 which bridges the gap between consumer and business by offering good power and style. Few machines stand up to the M6800's business pedigree, but it's not all positive. The M6800's 3.8kg weight and 40mm thickness mean it's bulkier than every machine mentioned here, so you'll need a robust case. It's not exactly a looker, either: the gunmetal grey metal and exposed seams highlight a system designed for function, not form. As usual, Dell sells several M6800 specifications. The cheapest, at £1,739 (around US$2,930, AU$3,140) has less RAM, a smaller hard disk and AMD FirePro graphics, and the model up from our sample has a better processor and an SSD alongside the AMD GPU. The top model is a £2,675 (around US$4,500, AU$4,830) beast. For that cash you get a better Nvidia GPU, a faster processor and improved storage. The three-year warranty is generous, and four- and five-year packages are available. Anti-theft options, customisable installations, factory BIOS tweaks and recovery tools add to the M6800's business credentials, and the Precision is available with Windows 7, Windows 8 or even Linux.